ISLAMABAD, Pakistan (CNN) -- Pakistan's lower house of parliament convenes Monday evening with the task of removing President Pervez Musharraf from office high on its to-do list. President Pervez Musharraf stepped down as the chief of military last November. But the process of unseating Musharraf, who seized power in a bloodless coup almost nine years ago, will not be quick nor easy. The first step towards impeachment will involve compiling a list of charges against Musharraf. Sherry Rehman, spokeswoman for the ruling Pakistan People's Party, told reporters that lawmakers are preparing a charge-sheet that is "strong, voluminous and (a) powerful indictment of his systematic misrule and usurpation of parliament's powers." She said it will take lawmakers several days to finish compiling the list. The document will charge Musharraf with corruption, economic mismanagement and violating the constitution, among other malfeasance, she said. Once lawmakers submit charges, the National Assembly -- the lower house of parliament -- will vote on whether to move forward with impeachment. A majority vote would be required for the charges to be considered. Next would come an actual vote on impeaching Musharraf. Members of the National Assembly and Senate would cast ballots. Two-thirds of lawmakers would have to vote 'yes' for Musharraf to be impeached. Rehman said the ruling coalition has the support of more than 350 members -- more than the required majority. But it is unclear whether the numbers are indeed so clear-cut. The parties opposed to Musharraf have 274 members in the National Assembly and the Senate. They will need 295 out of 440 seats. They can get to that number if some independent lawmakers vote with them, along with some defectors from Musharraf's political party, the Pakistan Muslim League-Q. 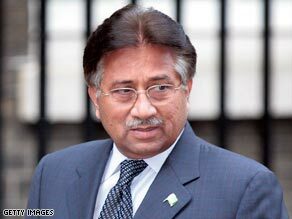 In the meantime, the four provincial assemblies are expected to ask to cast votes of confidence on Musharraf this week. Musharraf can decide not to call for such a vote. Even if he does -- and lawmakers agree that they have lost confidence in the president -- the vote is non-binding. But symbolically, it might add pressure on Musharraf to step down. Presidential spokesman Rashid Qureshi said it is unlikely that he will do. "There are no grounds for a resignation or an impeachment," Qureshi said. He can step down and save himself the ignominy of an impeachment. No president has been impeached in the country's history. He can hope that the vote to impeach him falls short. He can dissolve parliament and declare a state of emergency. For him to do the latter, he would need the backing of the army, which has ruled Pakistan for more than half of the country's 61-year history. Musharraf stepped down as the chief of military last November. He has seen his power erode significantly since then, especially after the opposition parties swept to victory in parliamentary elections in February. It is unclear how much support he still has among senior military leaders. The army has indicated that it wants to stay out of politics. "Many of the people who were really close to him are either not with him, or behind the scenes they are trying to collaborate with the current rulers," said Ishtiaq Ahmed, professor of international relations at Islamabad's Quaid-i-Azam University. "His options of staying in power are really limited now." Musharraf has long been an ally of the United States, which has poured billions of dollars in aid during his administration to deprive Islamic militants of the sanctuary they have established along the country's rugged border with Afghanistan. But Washington has said it will remain neutral on the impeachment issue. "We have consistently said the internal politics of Pakistan are an issue for the Pakistani people to decide," said U.S. State Department spokesman Gonzalo Gallegos last week. For many Pakistanis, the political machinations take a back seat to far bigger problems in the country: shortage of essential food items, power cuts, and a skyrocketing inflation. "I think 70 percent of the people are wondering when the prices are going to come down and when we're going to be able to put food on the table," said resident Atique Rahman. "So I think either way, the quicker the better so that the people can move on."